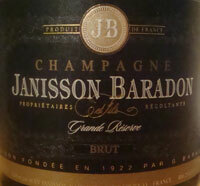 Janisson-Baradon et Fils Champagne is a Grower Producer located in Epernay with 9.3 hectares of vines primarily on the western hillsides of Epernay with some small plots in Chouilly and Brimont. They have slightly more than 4 hectares each of Chardonnay and Pinot Noir, and almost one of Pinot Meunier. Started by Georges Baradon in 1922., they are run by their 4th and 5th generation winemakers now, Richard Janisson and sons Maxence and Cyril and make about 90,000 bottles a year. They practice "lutte raisonnée" meaning a pragmatic approach towards wine growing which limits chemicals to use when absolutely necessary as well as encouraging biodiversity: For example grass has been grown between the vines since 1999, and they have also not used chemical pesticides or herbicides for the past 13 years. Each parcel of vines is pressed and vinified separately, and aged in small oak barrels (used Burgundy Barrels) and steel tanks. Blending is a family affair. Click here for their French language update (English coming they say) which doesn't appear to be recently updated, and click here for their regularly updated blog. 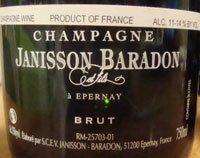 Brut - 50% Pinot Noir, 40% Chardonnay, and 10% Pinot Meunier. Sometimes described as an aperitif wine. Even this entry level wine contains a lot of barrel aged reserve wines in its blend, approximately 1/3. Grande Reserve Brut NV - Half Pinot Noir and half Chardonnay, with 30% oak barrel aged reserve wines added. This is aged at least 5 years before release. A big step up in quality from their Brut. Selection - Similar to the Grand Reserve in that it is 50% Pinot Noir and 50% Chardonnay, with 30% oak barrel aged reserve wines added. This is aged at least 3 years before release. Rose - 44% Pinot Noir and 44% Chardonnay with 13% still red wine added. Non Dosé - half Pinot Noir and half Chardonnay, with 30% oak barrel aged reserve wines added. Aged at least 3 years before release, and with no added dosage (sugar). Demi-Sec - Their sweet Champagne. A Pinot Noir dominant blend of Pinot Noir, Pinot Meunier, and Chardonnay. They suggest paring with foie gras, and that sounds heavenly! Their Millésimé, Grand Cru Millésimé (100% Chardonnay), and Special Club bottlings. Les Toulettes Blanc de Blancs Brut - an all Chardonnay wine from the plot of vines named "Toulette" and planted in 1947. Tue Boeuf - a Blanc de Noirs, 100% Pinot Noir wine. Cuvée Prestige Georges Baradon Brut - their Prestige Cuvée, aged at least 6 years before release. 70% Chardonnay and 30% Pinot Noir. My notes start with "frigging delicious" as this was delicious from the first sip. Blanc de blancs, 100% Chardonnay, although I wouldn't guess that blind. The nose has minty minerals, a maritime salty quality, and apples - almost apple cider initially. A slight reductive quality which built with time and then diminished. The palate is powerful with plenty of minerals with a slight minty/definitely spicy characteristic, a creaminess with some air, some apple, and crisp acidity. Extremely well balanced, despite the nose and palate swimming in delightful minerals. Oak influence is obvious and well integrated (although I can't find anything stating they use oak for this, I'm quite certain). All Pinot Noir and it shows. Tue Boeuf means "Kills Beef" - is this a big enough wine for beef? Maybe not a bloody Prime Rib but I bet it would be phenomenal with a Boeuf Bourgogne! Medium yellow with lots of small bubbles. Upon opening, The nose immediate has small red berries, followed by purple flowers like violets, and a spicy minerality. Nice chalk as it warms and breathes. On the palate we have small red berries, cherries, and it is powerful and long and mouth puckering in a good way with a lovely maritime type minerality. Raspberries as it breathes. A class act! At first I thought this might be slightly corked, but as it warmed and opened it did get better and the bitterness on the aftertaste passed. Also, the lone rating I found online was similar. No blockbuster but OK. I have drank other bottles from this producer since as you can see from the tasting notes. Pale Yellow with a moderate amount of medium sized bubbles. Nose: a hint of oxidation, some orange fruits, honey and minerals. Macintosh apple with air. On the palate, this has an oxidative style. Long, smooth and slightly honeyed. Bitter aftertaste initially that was gone after some air. Warm apple, nearly baked, as it breathed. Not 100% sure this was not an "off" bottle. The nose starts with some pretty green apple followed by chalk. Hints of lime. The palate is almost slightly syrupy in feel initially, with some hints of honey, and very nicely balanced. Elegant as it airs. As it warms it develops a wonderful rolling spicy/minerally orange, almost candied orange peel, characteristic.